To cover or not to cover brisket in sauce is a customer's inalienable right. So, it's not only presumptuous of the joint to shellac your meat in their "award-winning" sauce without asking, but it's also a crutch used to hide all manner of barbecue sins. A dark, sticky, liquid smoke-infused sauce can cover up foreign flavors (think lighter fluid or propane), or meat lacking the flavor of real smoke. It also masks the bleak, gray appearance of meat that has been wrapped in foil, reheated, and/or steamed flaccid. The same goes for any restaurant that frolics in the kind of "our sauce is boss" chest-bumping braggadocio you see on Food Network cooking competitions. If the sauce gets more airtime than the meat, something ain't right. By definition, barbecue is made by the intermingling of meat, wood smoke, and fire. If there's no sign of cooking wood in plain sight or no distinct smell of smoke in the air, then there's no barbecue in the house. And I don't mean sacks of sawdust that the restaurant sprinkles over a fire to create the illusion of wood smoke. You want to see a cord of oak, pecan, hickory, mesquite, or any other type of smoking wood stacked or piled somewhere in the proximity of a hulking, smoke- and grease-blackened pit. In barbecue, using gas, electricity, solar power, wind turbine, or any other primary heat source other than wood on fire is a big no. Liquid smoke is made from torching wood chips and funneling the smoke into a condenser, where it cools and drips while more water is added to bulk up the smoky brew (think redneck molecular gastronomy). It has a highly concentrated smoky flavor, and when dumped into marinades, sauces, or mops, liquid smoke produces an unholy and unmistakable chemical note. Any restaurant which uses smoke flavor poured from a bottle is covering up the fact that their "barbecue" is cooked in a gas or electric oven. The waft of a line cook's Camel unfiltered is the closest your meat ever got to smoke. They proudly advertise ribs that "fall off the bone"
If eating the barbecue doesn't require your central and lateral incisors (and the meat could be sucked, with just a little effort, through a straw), the restaurant is boiling and/or steaming the meat first and grilling or broiling it to finish, which gives brisket, ribs, and pulled pork the appearance of being cooked over flames. Properly cooked ribs may pull or tear clean off the bone, but they should never slide off. 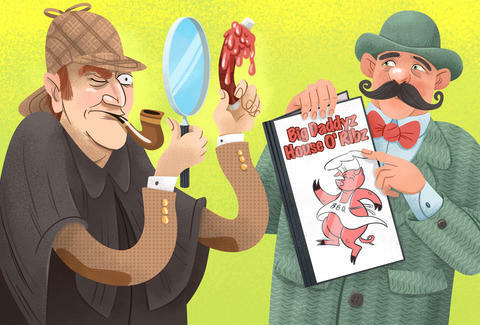 Amateurs might call it tender, but barbecue traditionalists know a fake by the telltale mushy, flavorless, and overcooked meat Jell-O they serve. If you pull into the parking lot of Bubba's Shak or The Jernt or Big Daddyz BBQ Hut, case the place for all of the above and proceed cautiously until you can confirm the existence of an active smoker. 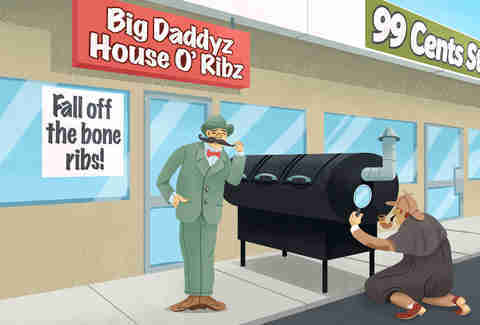 Generally, restaurants that play up the "we're authentic barbecue hillbillies who can't be bothered with spell check" schtick are banking on customers who eat up Southern stereotypes as greedily and carelessly as they scarf down boiled-and-grilled bar-b-q'd ribz. If Radio Shack and a 99¢ Only store flank the restaurant, it's safe to assume that local fire codes prohibit live wood and charcoal cooking on the premises... unless there's a massive, expensive exhaust-ventilation system. If the restaurant can afford such a system, you can bet they're not setting up shop next to T.J.Maxx. And that's all it does. It sits. The restaurant might fire up a few logs to trick your senses into thinking "this here is where real barbecue is happening." Or the cooker gets hauled to the occasional catering gig or competition. But mostly it's a $30,000 neon sign for the restaurant, and the meat you're eating never saw the inside of that (or any other) smoker. These rigs are often purchased by overzealous winners of barbecue competitions who quit their day jobs to open barbecue restaurants. When the owners realize the time and labor involved in operating a smoker to feed the masses and the dicey ROI in authentic barbecue, they bench the wood-fired rig and go gas. Colleen Rush is a New Orleans-based food writer and co-author of Low & Slow: Master the Art of Barbecue in 5 Easy Lessons and Low & Slow 2: The Art of Barbecue, Smoke-Roasting, and Basic Curing, written with Chicago pitmaster Gary Wiviott. Follow them at @FoodRush and @LowSlowBBQ.